Time to revisit those disaster plans! As much as one can prepare the reality is you never believe the worst will happen until it actually happens. The tragedy of 9-11 was my first hands-on experience in dealing with initiating a disaster recovery plan. Despite being with a well established multinational insurance company with plenty of documented protocols for dealing with disasters, there were still lessons learned. Unfortunately it seems that we have to suffer a disaster before we take the steps necessary to truly prepare for them. The Sandy “Super Storm” has been the latest disaster to expose weaknesses in existing plans – assuming of course you had a plan to begin with. Back in February 2010 I wrote in Blizzard Warning in the East! Can your claims department keep running if the office closes? about preparing your office in case of disaster. Clearly the recent events of “Super-storm Sandy” made me revisit the subject. Unlike other events, the Sandy storm really brought the worst possible scenarios together in one event. Buildings flooded, transportation went down, gas shortages grew, and several areas suffered extended power outages that lasted for weeks. While coastline areas are still dealing with the storm, and will be for months and years, many of the business areas are finally getting back to normal. The insurance industry, like many, faced challenges from a business operations perspective. While companies instituted there well managed disaster recovery plans, the widespread nature to a major metropolitan area exposed weaknesses in these plans. Insurance companies extensively prepared to manage an influx of claims, knowing how to deploy resources to disaster areas and trained to initiate those plans. Large insurance companies with multiple claims office locations across the country could deal with local offices that were impacted. However, smaller carriers with local operations may have prepared well on how deploy adjusters to the disaster areas, but they likely did not expect to have problems with their claims offices 20 miles from the coast. Other entities that one would have expected would have been prepared for a large storm also found how unprepared they actually were when faced with the Sandy Contingency. A major hospital in New York lack of preparedness forced mass evacuations of critically ill patients and created a ripple affect to surrounding medical facilities forced to take in an influx of patients. 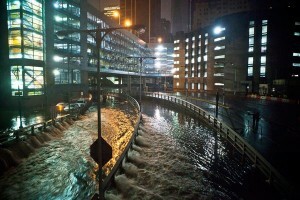 (see Sandy Exposed Hospitals’ Lack of Disaster Preparedness). The Sandy Contingency will dictate the need for a new approach to disaster planning. Often times the disaster plan deals with a single event that causes a disruption in an area for a relatively short period of time or one location for a long period of time. Sandy showed us a disruption in a large area for a long period of time. This was further complicated by the fact that almost no one dealt with a 1 in a 500 year scenario in an place such as the New York Metropolitan area. Extensive power outages lasting more than a week. It took almost a week to restore power to half of Manhattan and even longer to areas within a 100 miles of the city. This widespread power outage meant that business with back up locations within that area were still unable to get running. The “we have great technology and our employees can work from home” plan proved to be useless in many instances as there was no ability to work from home without power or Internet connections. Transportation disruptions went beyond some minor inconvenience. Public transit disruptions and gas shortages lasted weeks and made it extremely difficult to get employees back into the office or to remote locations. The impact on such a wide area exposed holes in many contingency plans. The restoration of power and services alleviated some of these issues and allowed people to work from home, however, the difference wasn’t felt for at least a 10 days. Did businesses really expect to have a complete office down for 3 days? 5 days? 10 days? Flooding in places that you would never expect. I am not sure many business in lower Manhattan expected extensive flooding to inundate basement facilities and significantly damage electrical service at the building. Some buildings lost not only electrical equipment but their entire HVAC plant. Some of those office are still closed and will be for months. And while lower Manhattan should have expected the possibility of basement flooding, I don’t think anyone thought how extensive it would be. So how can we improve our planning? Think about crazy possibilities. It’s time to put away the “that won’t happen here” mentality and figure all bets are off the table. Assume tornadoes in a non-tornado prone area, earthquakes in a non-seismic area, and flooding in places you never thought of. If Sandy showed me anything it was that holding to ideas that it can’t happen here is a dangerous way to plan. I know some of the planning around the doomsday event may seem silly, but it’s worth having the discussion and some form of plan. Does that mean we plan for alien’s attacking the Earth? Maybe not, but using some of the crazy Hollywood movie plots may not be an absurd way to think of possible scenarios. Is your back up area really far enough away? 100 miles was not going to help get your business up and running in short order if your office was in Lower Manhattan and your back up office was across the river. When you factor in the regional power outages neither was the “work at home” a viable solution. Redundancy plans have to consider the possibility of moving people greater distances in the short term. That may mean factoring in office space and lodging for a few key team members in a location in excess of 100 miles. Practice. Practice does make perfect. Practice also will allow you to test even crazier events to see what problems might come up. A few years back I participated in a Government test regarding preparedness to handle a pandemic virus. Each day we received a new set of events (i.e. transportation shut down, martial law imposed, hospitals shutting down) that we were asked to deal with and discuss how we were to handle our operation. Even with a well honed plan we were found some weaknesses and areas to improve. Mock disasters are a great way to perfect your plans and expose your weaknesses. that can’t happen here” thinking and prepare for a wider set of potential circumstance. The more we prepare for the unexpected the better chance we have of limiting the effects. What lessons did you learn from Sandy? Tagged with Best Practices, Claims Operations, Claims Staff, Disaster Preparedness, Management, Sandy Contingency.